Rising above the city and anchored by the renovated landmark Burnham Building at the corner of Washington and Summer Streets, the 53-story skyscraper, Millennium Tower, is the newest addition to Boston. Such a historic, monumental construction project defies imagination because of the economies, technologies, politics and logistics involved. Gargantuan machinery, thousands of workers, engineering, trade unions and ingenuity brought together to assemble luxury retail and residential spaces for the city’s citizens who want to be at the apex of the action. 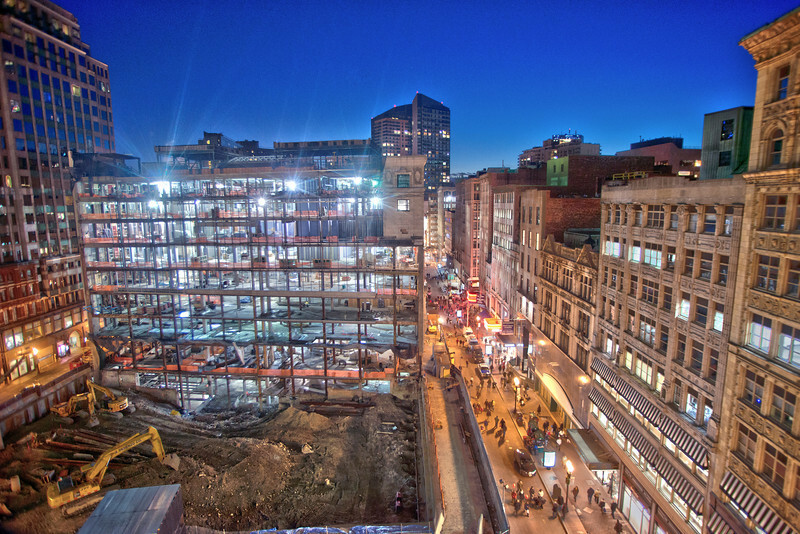 DowntownCrossingProject.photography documents this seminal change to Boston’s skyline. 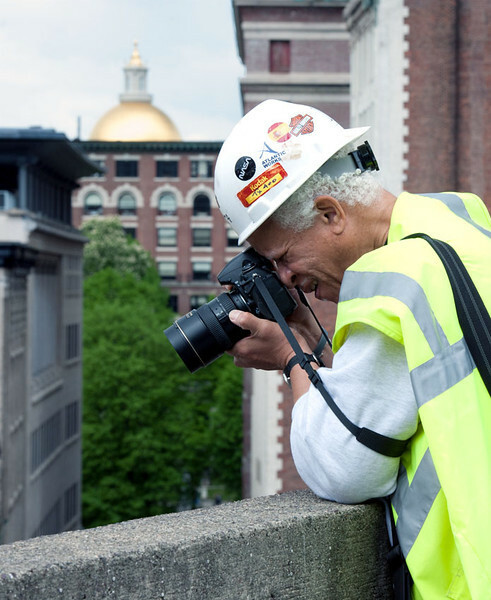 Photography records the innovations in design, changes in the neighborhood, diverse faces and fearless heroics of the men and women whose labors are reinvigorating the center of Boston. These photos were commissioned by Millennium Partners in order to record and honor their work. In the traditions of Lewis Hine, Margaret Bourke-White and W. Eugene Smith, photography is best suited to showcase the architectural beauty, dizzying heights and complex conditions of development and construction. Through the Internet and social networking, we will provide an intimate look inside the normally hidden, just outside the purview of passersby. We intend to reveal the high tech methods, age-old craftsmanship and artistic metamorphosis that are happening in world class metropolises today. Lou Jones’s eclectic career has evolved from commercial to the personal. It has spanned every format, film type, artistic movement and technological change. He maintains a studio in Boston, Massachusetts and has photographed for Fortune 500 corporations including Federal Express, Nike and the Barr Foundation; completed assignments for magazines and publishers all over the world such as Time/Life, National Geographic and Paris Match; initiated long term projects on the civil wars in Central America, death row, Olympic Games and pregnancy; and published multiple books including Final Exposure: Portraits from Death Row, Travel & Photography:Off the Charts and the recently released second edition of Speedlights & Speedlites: Creative Flash Photography at Lightspeed. Jones has served on the boards of directors of numerous photographic associations, societies and museums, such as the American Society of Media Photographers, Photographic Resource Center and the Griffin Museum of Photography. Nikon has honored him as a “Legend Behind the Lens” and Lowepro named him one of their “Champions”. Jones’s work is included in collections at the Smithsonian Institution, DeCordova Museum, Fogg Museum, the African American Museum in Philadelphia, Wellesley College and the University of Texas. Jones’s work has remained relevant, progressive and current throughout. He has mentored dozens of aspiring artists and documentary photographers. He has been an advocate for artist's business, legal and historical rights, and visual literacy in all corners of our daily lives. All Photographs on this site copyrighted by Lou Jones and cannot be used for any commercial purposes.